Having children below 5 years in your family? Not yet got aadhaar card for them? Wondering how you can get aadhaar card for your small kids? Here is the perfect guide on how to apply. Read on! The Unique Identification Authority of India (UIDAI) has recently launched a new blue coloured Aadhaar card or 'Baal Aadhaar' card. This card is for those children who are under the age of 5. So even for your newly born baby can get aadhaar card if birth certificate is available. According to UIDAI, this blue coloured aadhaar card is being issued for small kids and it can be updated when the child grows. That is there are two updates required. One at the age of 5 and another update is at the age of completion of 15 years. There is NO fee for these two updates. For Baal Aadhaar card, bio-metrics will not be recorded. That is no finger print or eye impression is scanned. You should only need to give photo of the baby and birth certificate along with one of the parent UID number, ie) Aadhaar card. Below are the steps you have to follow to get blue aadhaar card for your children. Fill up the enrollment form. Give your or your spouse's Aadhaar card number for the authentication purpose. 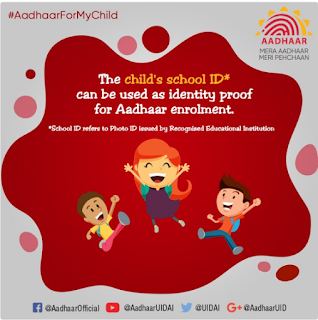 Child's 'Aadhaar' will be linked to the UID (Aadhaar card number) of his/her parents. Give a valid mobile number for the child. Give separate number to register with the blue coloured 'Baal Aadhaar' card. The officials will take a photograph of your child. They will NOT take any biometrics as the age of the child is below 5 years. After the confirmation, collect acknowledgements slip. Alternatively, you can check out at the UIDAI website to know the status of your child aadhaar card to see whether aadhaar is generate or not. Once it is generated, you can download the baal aadhaar card and make a printed copy for future use. Hope you understood the process of how to get a blue coloured aadhaar card for your child. If you have any doubts / query, you can make a comment below so that we will try to rectify your doubts.